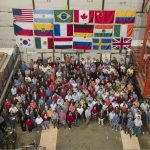 Batavia, Ill.—Scientists of the DZero collaboration at the Department of Energy’s Fermi National Accelerator Laboratory have achieved the world’s most precise measurement of the mass of the W boson by a single experiment. Combined with other measurements, the reduced uncertainty of the W boson mass will lead to stricter bounds on the mass of the elusive Higgs boson. The W boson is a carrier of the weak nuclear force and a key element of the Standard Model of elementary particles and forces. The particle, which is about 85 times heavier than a proton, enables radioactive beta decay and makes the sun shine. 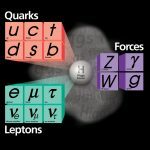 The Standard Model also predicts the existence of the Higgs boson, the origin of mass for all elementary particles. Precision measurements of the W mass provide a window on the Higgs boson and perhaps other not-yet-observed particles. The exact value of the W mass is crucial for calculations that allow scientists to estimate the likely mass of the Higgs boson by studying its subtle quantum effects on the W boson and the top quark, an elementary particle that was discovered at Fermilab in 1995. 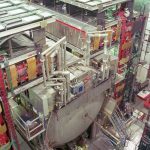 Scientists working on the DZero experiment now have measured the mass of the W boson with a precision of 0.05 percent. The exact mass of the particle measured by DZero is 80.401 +/- 0.044 GeV/c2. The collaboration presented its result at the annual conference on Electroweak Interactions and Unified Theories known as Rencontres de Moriond last Sunday. 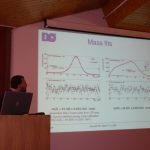 The W mass measurement is another major result obtained by the DZero experiment this month. 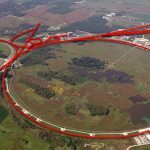 Less than a week ago, the DZero collaboration submitted a paper on the discovery of single top quark production at the Tevatron collider. In the last year, the collaboration has published 46 scientific papers based on measurements made with the DZero particle detector. DZero is an international experiment of about 550 physicists from 90 institutions in 18 countries. It is supported by the U.S. Department of Energy, the National Science Foundation and a number of international funding agencies. For more information on the InterAction Collaboration, visit www.interactions.org.